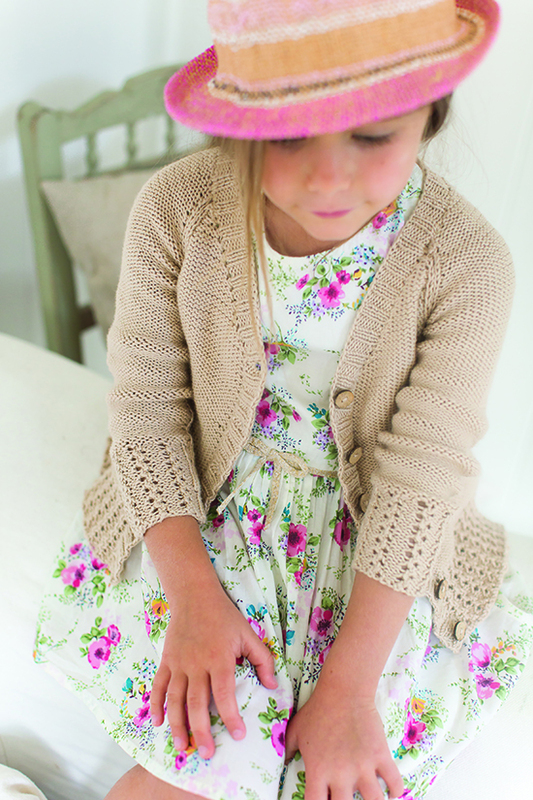 Two Summerlite Tops + Little Rowan Cherish Giveaway! It doesn’t matter what time of year it is or how hot it is I will always been knitting. 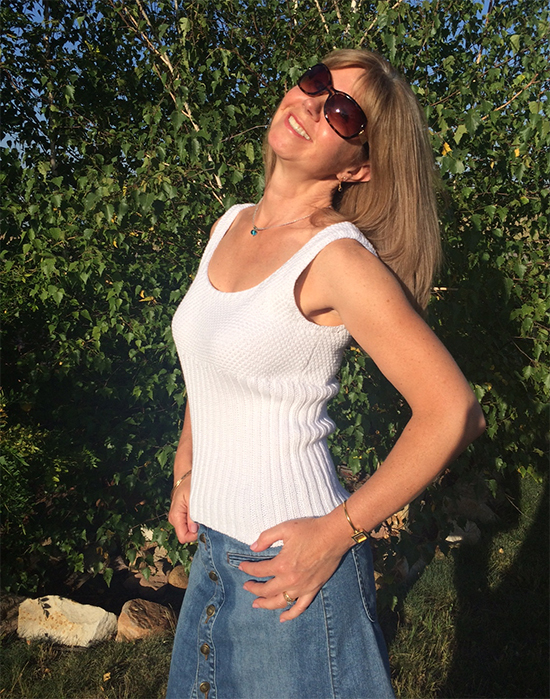 In the roasting temperatures of a Coloradan summer, (35 C / 95 F every day pretty much) I knitted these two tops from a 10 skein pack of Rowan Summerlite DK, What a bargain! 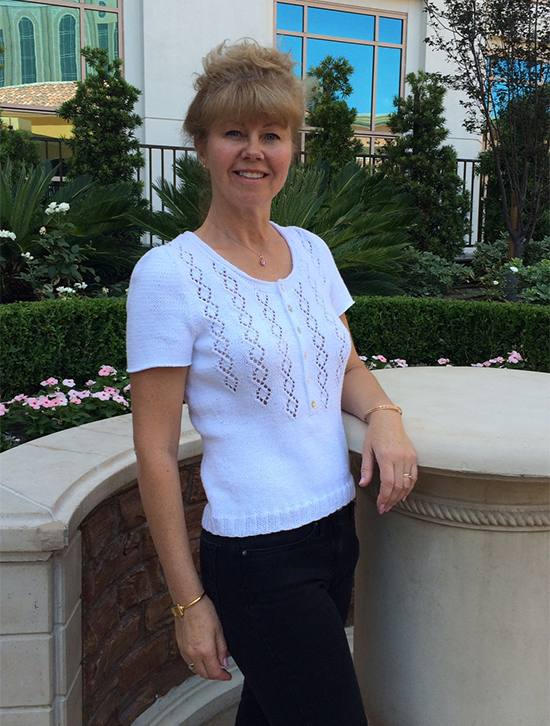 The first one I knitted up was Rossetti, a short sleeve summer top from the Summerlite DK collection by Martin Storey. It was relatively easy to knit on 3.75mm (US 5) knitting needles, if you have some experience, and the yarn is made from Egyptian Giza cotton making it very soft to handle and wear. I have already worn and washed it by hand and laid it flat to dry and was happy there was no shrinkage or pilling. The ball band states that it is machine washable but I rarely do this with garments that I have knitted; you never know what is going on in the washing machine once you close the door and hit the start button. Far too scary for me! As this is a DK yarn (Summerlite also comes in a 4ply version) and knits to a general DK tension there are so many patterns out there to choose from. 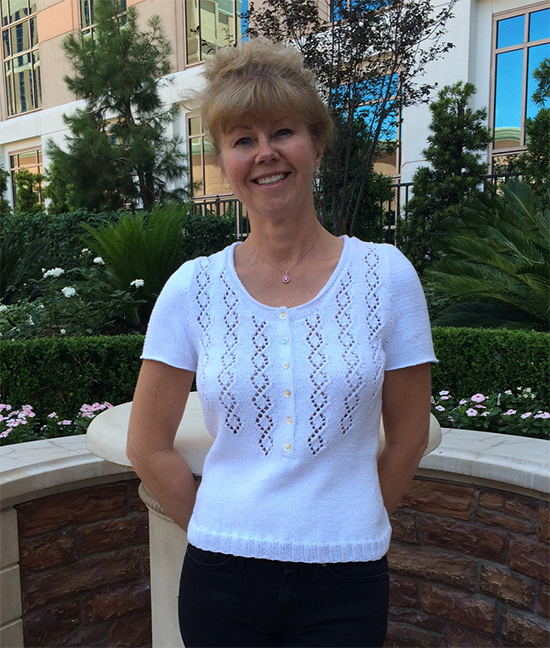 I subscribe to Vogue Knitting International and my eye was drawn to a little vest top in the Early Spring 2016 edition. 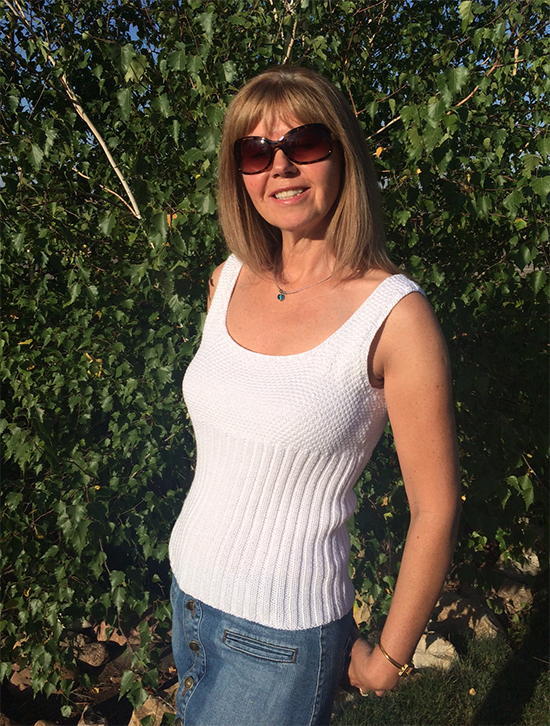 This Deep Rib Tank designed by Annabelle Speer is shown here knitted in Fixation from Cascade Yarns. 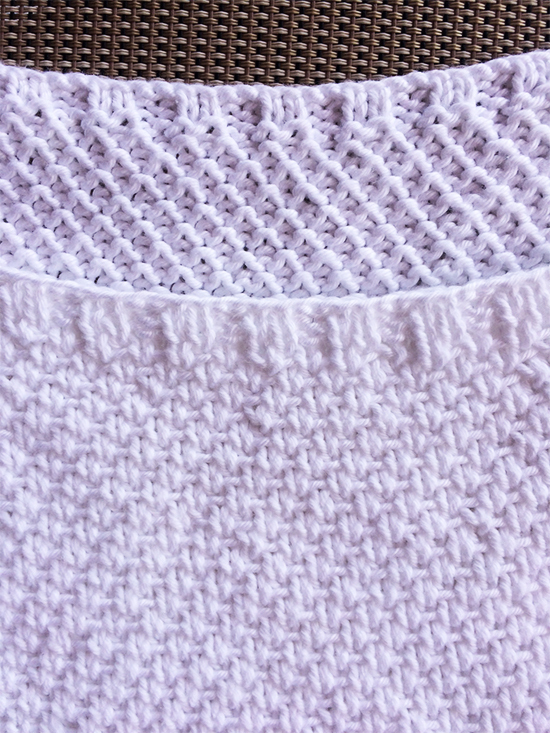 Although Fixation knits to the same tension as Summerlite DK, 22 stitches to 10 cm (4 inches), the yarn’s fibre content is different: 98.3% cotton and 1.7% spandex. However, I went ahead and knitted it up despite this minor concern and loved the result. And here’s a view of the back………..
I’m pleased I ignored the way it fitted on the model; it appeared to be way too big for her as you can see below in these pictures ……. I always try my knitting on as I go just to make sure I am getting the fit I want. There is no point knitting for hours and hours and then finishing up with something you can’t wear. I do this by selecting a similar top from my wardrobe, laying it flat and then laying my knitting over it holding the side seams on top of one another. If your knitting is too wide or too narrow nows the time to stop and re-evaluate your tension and maybe start again. You did knit a tension square before you started, didn’t you? Of course you did! But sometimes your knitting tension changes when you knit something larger and for longer so it’s always best to measure your knitting before you’ve gone too far. Making sure of fit is probably very much crucial with this rib tank as the bust area is knitted using a particular stitch. It is a slip-stitch where you slip every other stitch with the yarn in front every other row. This means that the finished fabric will have very little stretch, which might be why the designer choose a yarn with some elastic added. Keeping this in mind I made sure that the slip-stitched area fitted across my bust and measured it over and over again against a similar fitting top. But what about that slip-stitch? I just love it…..both the right side and the wrong side. I have used it before and have seen it using rows of different colored yarn to create a kind of mock fair isle. 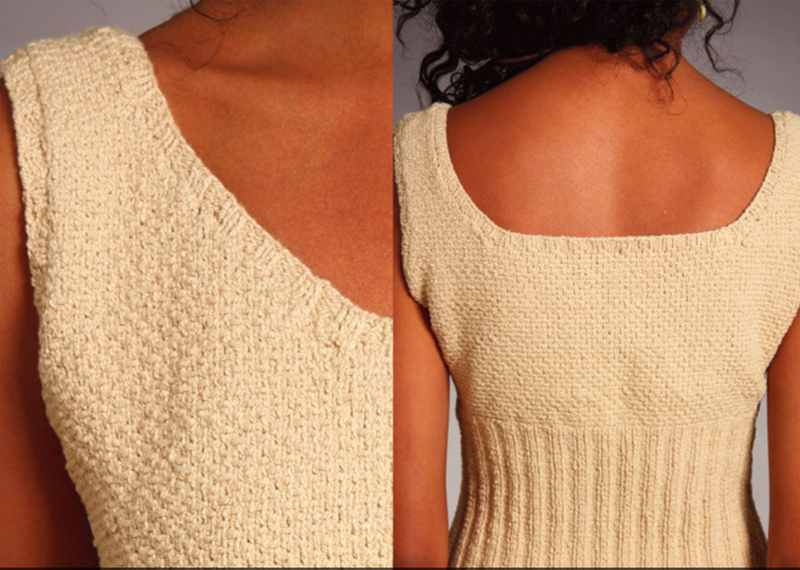 It looks just fabulous in Summerlite DK proving that this yarn has great stitch definition. 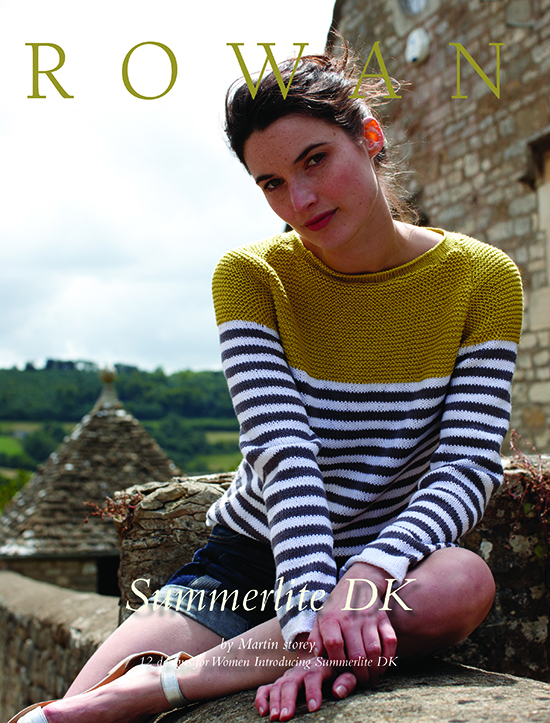 Rowan has also published a book of patterns, Little Rowan Cherish, for babies and children using Summerlite DK, Summerlite 4ply, Wool Cotton, Wool Cotton 4 Ply, Handknit Cotton and Softknit Cotton. 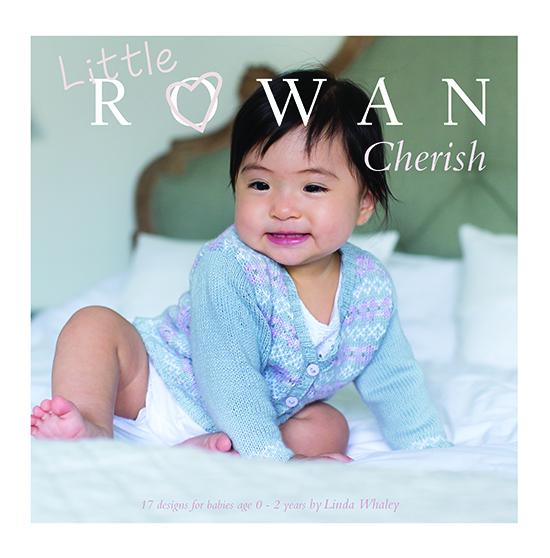 If you have little ones to knit for Rowan has published a pattern book called Little Rowan Cherish containing a collection of 17 designs by Linda Whaley for children aged between 0 to 2. Worked in DK and 4 ply weights, including Summerlite 4ply and DK, it features cardigans and sweaters, bonnets and blankets, socks and shoes. Here’s a couple of designs from the collection. What did I make with Rowan Summerlite 4ply during Spring 2015 and what 4 shades did I use? Send your answer to me by clicking on the ‘Contact Me’ link below. Do not leave your answer in the ‘comments’ section at the end of this post as that will make it visible to everyone …… and we don’t want to giveaway the answer until the competition is closed. Goodluck! This giveaway is now closed and the winner has been contacted by email.